As we start learning our Christian Mystical tradition, it can feel very fragmented. Timelines and figures jumble together and it can be tough to pull the threads apart and get a sense of the whole. We’re mostly exposed to the Mystics through an inspirational quote here, a recommendation there, or integrated into a modern mystical teaching. Richard Rohr, for example, often refers often to Francis, Bonaventure, and Duns Scotus. Thomas Keating refers back to John of the Cross, Teresa of Avila, and The Cloud of Unknowing. But how do the pieces fit together? Roughly speaking, the apophatic strand begins with some of the early Fathers and Alexandrian mystics and is finally articulated in the writings of Dionysius the Areopagite. This strand runs through the medieval and early modern mystics and finally down to our own day. This is our lineage. But one key component tying the pieces together is Richard of St. Victor, a 12th century mystic who drew upon and expanded the Dionysian tradition, much of which had been dormant for centuries. A Scottish theologian and scholar who became Prior of the Augustinian Abbey of St. Victor outside Paris, Richard synthesized both Greek and Latin mystical sources. Richard had an agile mind and was interested in showing the relationship between reason and theology. In this he serves as a kind of proto-Scholastic. But he’s also keenly interested in geometry, especially in his study of the Trinity. Richard wanted to provide a systematic, ordered account of the mystical ascent to God. 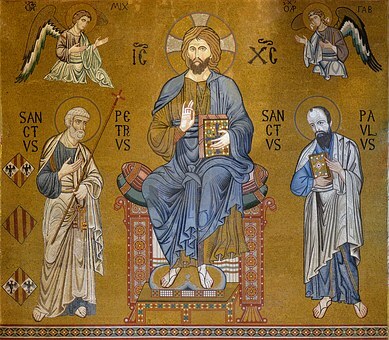 Richard held that the perfect beauty of God required a harmonious ordering of properties, and that in contemplation our inner selves become aligned with this divine perfection as we are drawn up into God. The purpose of knowledge, learning, and reason, is to serve as a stepping stone along this path to contemplation and mystical awareness. Richard emphasized the necessity of Trinity for a perfect expression of divine love. For there to be perfect love, it must be a shared love of a third, or what he called condilection, as with both parents for a child. His work is more scholarly and cerebral than many of the mystics. Though a hugely influential figure in the Christian mystical tradition, he can be occasionally overlooked as many of us have our entry point in more inspirational or lyrical passages from, say, St. Francis or the sublime Hildegard of Bingen. By the time Dante pens his masterpiece in the 13th century, Richard of St. Victor was sufficiently influential that Dante places him in the fourth heaven alongside wisdom figures like Solomon, Aquinas, and Dionysius.